As we've just noted, Apple has delivered a software update required for full functionality of its new Magic Trackpad device. In addition to Magic Trackpad support, the Mac OS X version of the update also extends several new functions to recent Apple notebook devices. In particular, recent MacBook and MacBook Pro models receive support for the inertial scrolling that debuted on Apple's current MacBook Pro models, in addition to the new three-finger window dragging gesture that it included on the Magic Trackpad. 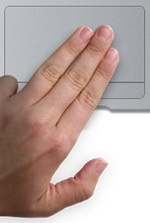 The MacBook Air, as well as "Early 2008" MacBook Pro models gain only inertial scrolling. Inertial scrolling, already present in similar forms on Apple's iOS devices and the Magic Mouse, allows users to "flick" while scrolling as the trackpad senses the momentum of the gesture and smoothly scrolls through long documents and libraries.